Winrock International » Greenhouse gas emissions from tropical forest degradation: an underestimated source. Authors: Timothy R H Pearson, Sandra Brown, Lara Murray, and Gabriel Sidman. Summary: The degradation of forests in developing countries is perceived to be an important contributor to global greenhouse gas emissions yet its impacts understudied and poorly understood. This is largely because international emission reduction programs have focused on deforestation, which is easier to detect and thus more readily monitored. To better understand and seize opportunities for addressing climate change, it will be essential to improve knowledge of greenhouse gas emissions from forest degradation. Here we provide a consistent estimation of forest degradation emissions between 2005 and 2010 across 74 developing countries covering 2.2 billion hectares of forests. We estimated annual emissions of 2.1 billion tons of carbon dioxide, of which 53% were derived from timber harvest, 30% from woodfuel harvest and 17% from forest ﬁre. Of the total emissions from deforestation and forest degradation, forest degradation accounted for 25%. In 28 of the 74 countries, emissions from forest degradation exceeded those from deforestation. The results of this study clearly demonstrate the importance of accounting greenhouse gases from forest degradation by human activities. 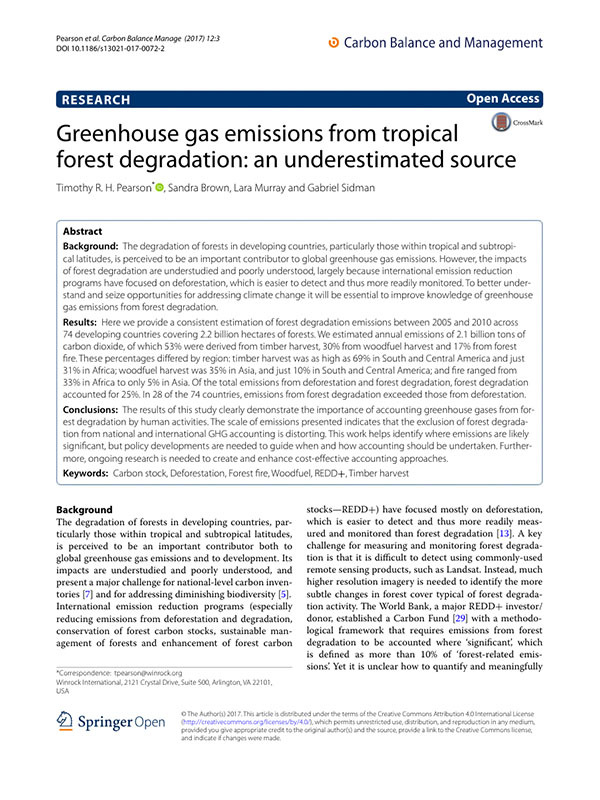 The scale of emissions presented indicates that the exclusion of forest degradation from national and international GHG accounting is distorting.